Guys, Kirsten + Dakota’s September 1 wedding was like something out of a fairy tale. 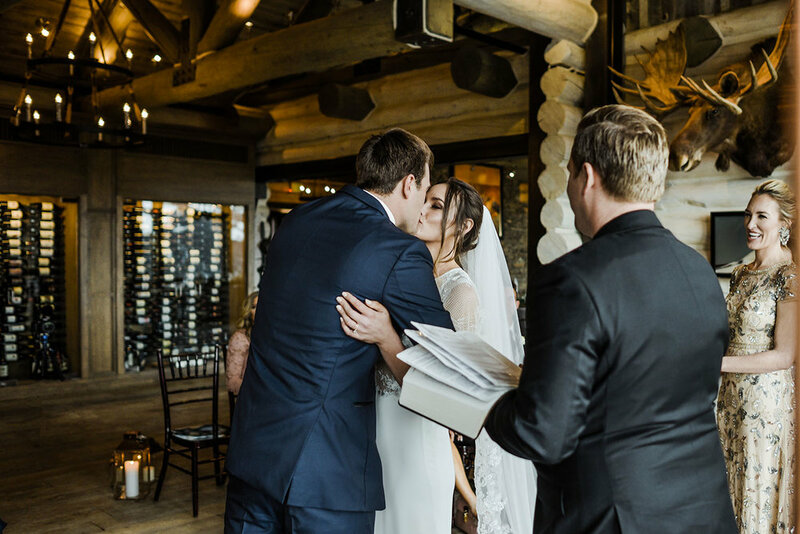 They were married at Le Petit Chateau in Bozeman, Montana, surrounded by so many loved ones. Something I’m seeing more of - that I’m absolutely loving! - is couples who have chosen to have larger weddings making time during their day for moments of intimacy as well. Kirsten + Dakota did this during their first look by opting to exchange the vows they wrote for each other at the same time, rather than during their ceremony. It was beautiful to watch them see each other for the first time in the privacy of a tucked-away corner, then to read the thoughts the other one had going into the day. They also chose to have an unplugged ceremony (allll the praise hands). For those who haven’t heard of this, an unplugged ceremony is one where the couple has requested that guests not use their phones, tablets, cameras, etc. during the ceremony, allowing each guest to be fully present. You know what I saw, instead of people trying to get “the shot” with their phones? I saw a groomsman reach over to grab his wife’s hand while Kirsten came down the aisle. I saw friends take the hand of the person next to them and give it a little squeeze before letting it go to wipe away a lone happy tear rolling down a cheek. I saw family glance at each other and smile before reaching over to squeeze a shoulder. Big picture, I saw Kirsten + Dakota’s friends and family observing, contemplating, and being in the moment with each other and it was so beautiful. Scroll on through for some favorites from their perfect late-summer wedding day! Autumn and Brock said "I do" on April 7 at Rainbow Lodge at the Yellowstone Club in Big Sky, Montana. For those unfamiliar, the Yellowstone Club is nestled very literally on top of a mountain, and while the rest of Montana was mid-thaw, the Club was still beautifully blanketed with at least a foot of snow, which made for the most beautiful, serene backdrop for their day. After getting ready, the valets took Autumn and Brock to the helipad for their first look. Surrounded by mountains, softly falling snow, and the grandeur of the Big Sky state, this spot made the perfect place for each to contemplate the day ahead of them for a moment before seeing each other for the first time. While waiting for Autumn, I asked Brock what he was thinking. He looked at me, then off into the distance for a moment before looking back at me and responding. Then he said: "You know, I've been with Autumn for a really long time. I'm just really looking forward to finally...being married. Yeah...it'll be really nice to finally be married." This simple sentiment was so beautiful to me: he wasn't thinking about the party that day, or what her dress might look like: he was simply looking forward to their life together after the day was over. I can't think of a more perfect response. Their first look was similarly contemplative: a couple of long, tight embraces and a few quiet words between them. As a bystander, it looked like they were "home." So clearly each other's rock, this few minutes of peace and comfort before heading back to their friends and family seemed like the perfect way to embark on their day. Twenty-five of Autumn and Brock's friends and family gathered to watch them exchange vows and celebrate with them. For those who know me, you know intimate weddings have my heart. As an introvert, I love seeing a couple surrounded by those closest to them, able to celebrate the start of their marriage together and intimately, rather than having to "host" a party (side note: there's no right or wrong way to do your wedding! For some, being able to celebrate with ALL their friends and family is the best way to go!). There was so much love in the room that day. So here's to a lifetime of health and happiness for Autumn, Brock, and their daughter Kamri! Scroll on through for some highlights from their day!